Are you teaching your baby any maths? We focus a lot on helping babies develop physical skills and learn to communicate but learning about maths starts at a very young age too. The whole ethos of our SUPERbaby series is on simple, playful things you can easily fit in with your everyday play with your baby so I’m not suggesting getting out any flashcards or doing any formal maths lessons but here are Five Maths Ideas for Babies that will blend in with your day easily and encourage your little one to have a great start in life. Counting: The first one’s the easiest and most obvious and is simply to count. When you use blocks to build a tower, when you place finger foods on your babies plate, out and about when you look at all the ducks you’re feeding, at home when you’re reading and looking at all the teddies in your story. Pointing to each item and counting them helps your baby learn the pattern of the numbers and importantly helps them learn one-to-one correspondence – that the word ‘one’ corresponds to one physical object. Subtraction and addition: It might seem strange to think about your baby doing calculations but the ideas of ‘One More?’ and ‘All gone!’ at a meal time are just that, and a very important starting point for later addition and subtraction. Dimensions: Babies just love exploring objects, passing them from hand to hand, turning them and putting them in and out of pots. If you give some thought to the objects you give them, trying to include lots of different shapes and sizes, you’re giving them the opportunity to learn about sizes and dimensions as they play. 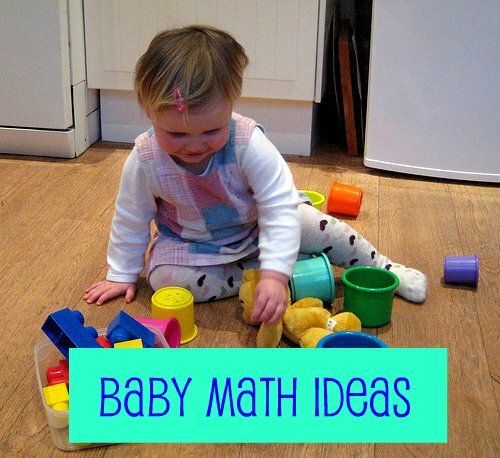 Provide interesting resources and let your little mathematician do the exploring. Singing: There are lots of nursery rhymes which use numbers and let you count up or down. Using props or your fingers as you sing reinforces the concepts of numbers relating to actual objects. Try Three Cheeky Monkeys, 12345 Once I Caught a Fish Alive or One Potato, Two Potato. Volume: Using water play (and sand play when they’re a little older) is a great medium for exploring volume. Simply add in some jugs and pots and let your baby (or help them to) fill the jugs and pour them in to the containers. Babies (and children – and adults too!) learn through doing, being part of the action and trying things out for themselves – and trying to pour a big jug full of water into a small container is a great lesson in volume. What else do you play to help your baby learn maths? Our SUPERbaby play series focuses on simple, playful ideas you can use with the youngest of children to have fun and encourage them to develop important early learning skills. The emphasis is on ideas you can easily fit into a busy week, using materials you’ll have around your home. 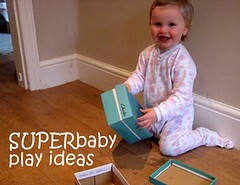 View all our SUPERbaby ideas here. Love the idea of introducing maths through basic play! loved this blog, very practical ideas! I am gonna use some of these. Studies show that babies are able to recognize quantity up to 3. They are wired for math! I love your collection of math activities! Thanks for linking! Hi The Monko – I think a lot of learning comes from things we do naturally with our children, remembered from things our parents did with us when we were small. I always like to mix ‘lessons’ in with everyday playing and doing, just like you say. Thanks for stopping by. Two more ideas that I did with my sons and do with my kindergarteners. Patterning – starting off with AB, then moving on to more complex patterns. Grouping – even as young as 12 months, my sons were able to separate the blue ones from the red ones. Now that my DD is putting things in her mouth LESS, we started playing with coins. We talk about the colors and sizes. We sort them that way as well as by penny, nickel, dime and quarter. She loves the jingling sound they make inside the jug and she loves to pick them up one-by-one or by the handful. She hands each on to me and I tell her it’s name and properties. We count the pennies by ones (only up to 5 and then starting over again). Then she also sees me group them in piles of five. She also loves to help me put them back in the jug “plink…plunk…” I like the idea posted earlier about patterns. Now we’ll practive lining the coins up by type first and then doing an AB pattern, like penny, quarter, penny, quarter. When she goes to taste one, I say “no mouth,” which we’ve worked on for a while, and she usually listens. What great ideas Jen – and lots of sensory play for her too as she works on her maths. Thanks for sharing them. Thanks for the ideas. ?